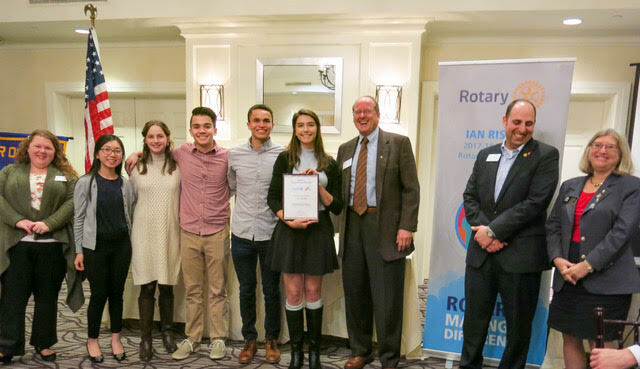 The Rotary Club of Leesburg is proud to congratulate and acknowledge the Heritage High School Interact Club for receiving the Interact Presidential Citation 2016-2017 from Rotary International. This is the first Interact Presidential Citation awarded in District 7610. As such, District Governor Ronnie Chantker was present as the Interact Board accepted the award. Participate in at least one activity that promotes international understanding. Introduce members to other Rotary programs for young leaders, such as RYLA or Rotary Youth Exchange. Participate in a school or community service project or fundraiser that supported these Rotary areas of focus; promoting peace, providing clean water, supporting education, growing local economies. Plan and carry out a service project for Global Youth Service Day. Participate in a career day or mentoring activity. Pictured left to right: Rachel Llanos (former Interactor, RCLB member, HHS Teacher and Interact Club Sponsor) Interact Board: Trinity Pham, Helen Salko, Cole Guinther, Brandon Davis, Nicole Jacuzzi (Interact Club President), Fred Williams (RCLB President), Dan Hampton (RCLB former President), Ronnie Chantker (District Governor). Photo courtesy of Ron Rogos.